Schiffbau-Gesellschaft, and German methanol distributor HELM AG. Fund- ed by the German government, designs for the new methanol ships will be de- veloped over the next three years.
? In March 2015, the Swedish ferry operator Stena Line, relaunched the Ste- na Germanica featuring the world’s ? rst dual-fuel methanol propulsion system. Control Areas (NCEAs), which current- culation Systems (EGR), but these tech- (International Code of Safety for Ships program. A new report released by FCBI Energy ly comprise the North American and Ca- nologies are complicated, costly, and using Gases or Low-Flashpoint Fuels) ribbean Sea ECAs, are required to meet largely unproven. which governs the safe handling of LNG in December 2015, and commissioned by the Methanol Institute (MI), details stringent ‘Tier III’ NOx emission stan- For the existing ? eet of some 100,000 and methanol fuels on-board ships. the many advantages of methanol. The dards. These Tier III standards require commercial vessels plying the world’s ? In December 2013, Methanex Cor- around 70% lower NOx emissions than oceans, and the 2,000 new keels laid poration, the world’s largest methanol report, Methanol as a Marine Fuel, con- the current Tier II standards and can’t be each year, the option of adding dual-fuel producer and distributor, announced tains a number of key ? ndings and can met simply by taking the sulfur out of capability for diesel-LNG (lique? ed nat- an agreement with Mitsui OSK Lines be downloaded HERE.
? 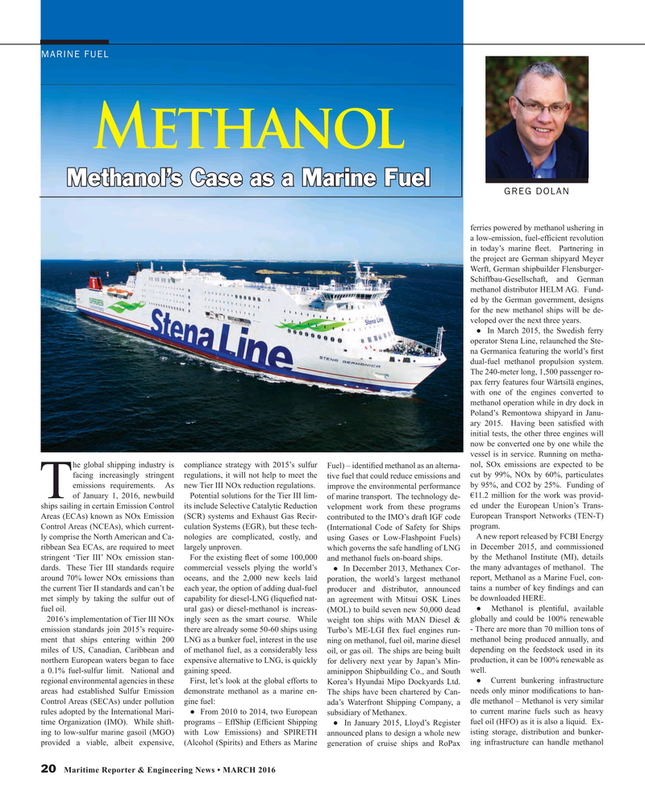 Methanol is plentiful, available fuel oil. ural gas) or diesel-methanol is increas- (MOL) to build seven new 50,000 dead 2016’s implementation of Tier III NOx ingly seen as the smart course. While weight ton ships with MAN Diesel & globally and could be 100% renewable - There are more than 70 million tons of emission standards join 2015’s require- there are already some 50-60 ships using Turbo’s ME-LGI ? ex fuel engines run- ment that ships entering within 200 LNG as a bunker fuel, interest in the use ning on methanol, fuel oil, marine diesel methanol being produced annually, and miles of US, Canadian, Caribbean and of methanol fuel, as a considerably less oil, or gas oil. The ships are being built depending on the feedstock used in its production, it can be 100% renewable as northern European waters began to face expensive alternative to LNG, is quickly for delivery next year by Japan’s Min- a 0.1% fuel-sulfur limit. National and gaining speed. aminippon Shipbuilding Co., and South well. Control Areas (SECAs) under pollution gine fuel: ada’s Waterfront Shipping Company, a dle methanol – Methanol is very similar to current marine fuels such as heavy rules adopted by the International Mari- ? From 2010 to 2014, two European subsidiary of Methanex.